We are the manufacture of the Regal Hardwoods line of Authentic Hand Scraped Hardwood Flooring. We sell our products exclusively through authorized distributors and dealers in the flooring business who sell our products to the public. Authentic Hand Scraped Hardwood floors are one of the most sought after features in homes today. 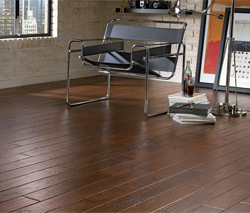 No other flooring offers the warmth and elegance of wood. No other company brings quality and value together like Regal Hardwoods. Each Regal plank is hand-scraped by three individual craftsmen to enhance the grain and bring out its individual beauty. And every plank is coated with our proprietary Titanium-Shield finish to keep your new hardwood flooring looking beautiful. We manufacture our own products, making this renewable, recyclable natural resource an affordable way to instantly add value to your home.